It can be easy to add a lot of coconut milk or cream to foods like curries or stews. You might also enjoy cooking with coconut oil or adding dried coconut to desserts. However, coconut should be consumed in moderation, since it's high in fat. Any side effects related to too much coconut are likely related to its fat content. In addition to these products, you'll also often find coconut used in a variety of desserts, pastries, candies and milk products, like yogurt. If you're very fond of coconut, this means that it might be easy to eat too much of this tasty food. If you are consuming coconut regularly, one of the most important things to do is to avoid sweetened products. Coconut is already naturally sweet, so it's best to omit coconut foods with unnecessary and unhealthy added sugars. When consuming coconut regularly, most people typically use coconut milk, cream or some form of dried coconut. Dried coconut is one of the coconut's most nutritious forms. It can be eaten raw, added to foods, cooked in baked goods, or even used to crust fried foods. It's an extremely versatile ingredient, as it's often sold as a shredded product or in flakes. You don't have to use dried coconut in the exact form it's sold in; you can easily turn it into a powder and use it to make desserts, pancakes or even to thicken stews as you would with flour. There are also 6.9 grams of protein, 64.5 grams of fat and 23.7 grams of carbohydrates in every 100 grams of dried coconut. Most people probably wouldn't want to eat more than an ounce (28 grams) or two a day, given how much fat this food has. In addition, there are small amounts (between 1 and 4 percent ) of other nutrients in coconut milk, like calcium, vitamin C, B-complex vitamins and choline. There are also 2 grams of protein, 21.3 grams of fat and 2.8 grams of carbohydrates in every 100 grams of coconut milk. Coconut milk has no fiber, which means that it benefits your health less than coconut meat. However, with less nutrients and less fat, you can comfortably consume about 100 grams of this product each day. Lower-fat options and coconut water are also readily available if you enjoy consuming coconut beverages frequently. Of all the coconut products available, coconut oil is probably the one that's easiest to consume in excessive amounts. Unlike coconut meat, milk or cream, you shouldn't consume anything approaching 100 grams of coconut oil on a daily basis. Coconut oil has none of the vitamins and minerals of other coconut products, but every 2 tablespoons (14 grams) has 13.5 grams of fat (21 percent of your DV). This product is also full of antioxidants and is the type of coconut product you'll see most commonly associated with coconut's benefits. Although coconut oil is not a comparable product to coconut meat or coconut milk from a nutritional perspective, it's generally considered to be beneficial for your health, in moderation. Coconut doesn't have too many side effects, but it does have a lot of fat. Coconut is made of up of polyunsaturated, monounsaturated and saturated fats, but is mostly saturated fat. Typically, saturated fats are considered unhealthy and, according to the American Heart Association, too much saturated fat can increase your cholesterol and risk of cardiovascular disease. However, other studies, such as a 2015 article in the British Journal of Nutrition, disagree. The debate on whether or not coconut oil had unhealthy side effects is mixed, because coconut is a plant. While excessive consumption of coconut oil does seem to increase inflammation markers because of its saturated fat content, it doesn't seem to be as bad for you as excessive saturated fat from animal products. Also, to obtain these negative side effects, you'd have to be consuming a lot of coconut oil—not just an extra tablespoon or so a day. In moderation, coconut oil can actually decrease certain inflammatory markers, instead. However, if you're still concerned, you can always substitute your coconut oil with a healthy, unsaturated oil, as the American Heart Association suggests. You should also be aware that the amount of fat in coconut is not only determined by the product, but by the age of the coconut. Younger coconuts have less fat, which means that older coconuts are those used to make fattier products, like oils. Eating coconut in moderation is typically associated with a wide variety of benefits. Obviously, the nutritional benefits of coconut are highly positive. This plant is particularly unique, as it's a high-fat fruit filled with protein, vitamins, minerals and antioxidants. While fatty foods should usually be consumed in moderation, coconut can be consumed fairly liberally compared to fatty meats, processed foods or fats like butter and lard. This is because the fats in coconut are actually good for you in moderation, despite being saturated. Unlike other saturated, fat-rich products, coconut can help lower cholesterol, prevent diabetes and won't negatively affect the health of your heart, though this information is disputed. Of course, this doesn't mean that you should feel free to consume excessive amounts of coconut. However, it does mean that, if you're on a low-carbohydrate diet and are trying to consume healthy fats, coconut can be a healthy choice. 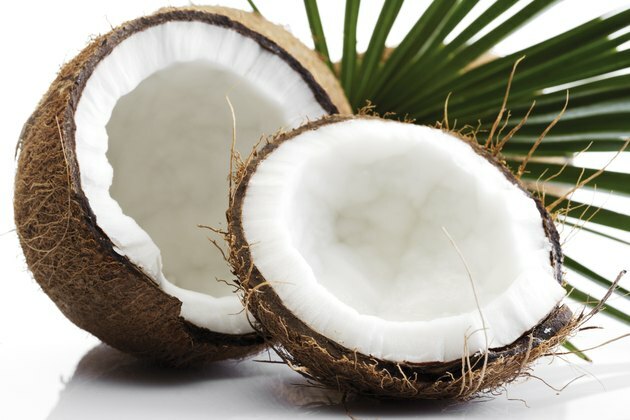 American Heart Association: Saturated Fats: Why All the Hubbub Over Coconuts?